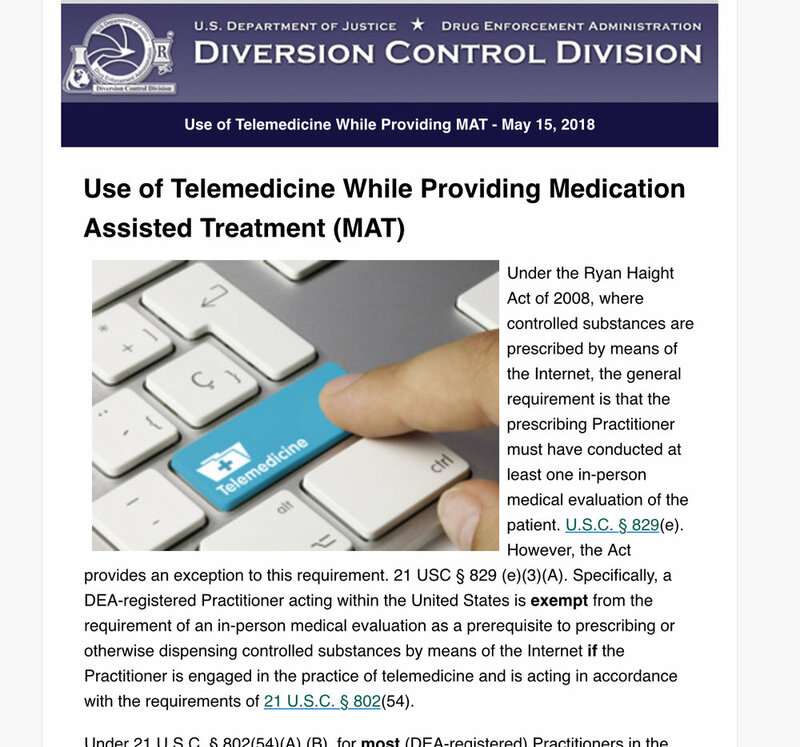 The DEA Drug Diversion Control Division sent an email alert on May 15, 2018, reiterating its position on the prescription of controlled substances via telemedicine under the Ryan Haight Act. While simply restating the existing law on the subject, the timing of the notice suggests the agency is clarifying its rules amid various efforts in Congress to amend the law. It remains a possibility that new legislation will accommodate more prescriptions via telemedicine, especially in the context of medication-assisted treatment for opioid addiction and other behavioral health disorders. The Ryan Haight Act currently allows for controlled substance prescriptions via telemedicine only in certain circumstances, including where the patient is being presented in a DEA-registered hospital or clinic (among other conditions). But this telemedicine exception excludes, for example, non-DEA-registered clinic settings where patients in underserved areas might seek access to a remote provider. One federal legislative approach is to expedite rule-making around the “special registration for telemedicine” called for under the Ryan Haight Act, which would apply to practitioners. Another proposal is to add “qualified community mental health centers” to the types of facilities that may present patients under the Act’s telemedicine exception. Under the Ryan Haight Act of 2008, where controlled substances are prescribed by means of the Internet, the general requirement is that the prescribing Practitioner must have conducted at least one in-person medical evaluation of the patient. U.S.C. § 829(e). However, the Act provides an exception to this requirement. 21 USC § 829 (e)(3)(A). Specifically, a DEA-registered Practitioner acting within the United States is exempt from the requirement of an in-person medical evaluation as a prerequisite to prescribing or otherwise dispensing controlled substances by means of the Internet if the Practitioner is engaged in the practice of telemedicine and is acting in accordance with the requirements of 21 U.S.C. § 802(54). -is registered under 21 U.S.C. § 823 (f) with the DEA in the State in which the patient is located. Please be advised that the remote Practitioner engaged in the practice of telemedicine must be registered with the DEA in the state where they are physically located and in every state where their patient(s) is (are) physically located. 21 U.S.C. § 822 (e)(1); 21 C.F.R.§ 1301.12 (a); Notice 69478 Federal Register / Vol. 71, No. 231 / Friday, December 1, 2006. Also be advised that all records for the prescribing of an FDA approved narcotic for the treatment of opioid addiction need to be kept in accordance with 21 C.F.R. § 1304.03(c), 21 C.F.R. § 1304.21(b), and with all other requirements of 21 C.F.R. Part 1300 to End.